If you payed attention, you might already have noticed that I’ve been not very active regarding the two challenges I’ve decided to do. That doesn’t mean at all that I’ve completely avoided them, though I’m pretty sure it looks like that. Truth be told, this year has not turned out to be exactly what I expected. Life’s like this, I know, and I don’t say it with the intention of complaining. I wouldn’t even say it’s bad. It’s not. It’s just that my reading greatly suffers from it, and even what I read, and when, and under what circumstances has changed a bit. But! I still want to complete these challenges (The Untouched Bookshelf Challenge, and The British Crime Classics Challenge), though the scheduling must obviously change a great deal. That’s okay, I guess. So, what I wanted is to share my idea about reading a certain book that would somehow add to both of my challenges! 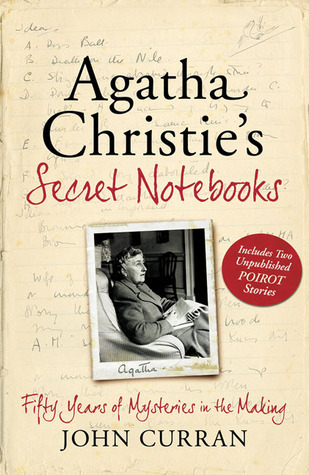 ‘Agatha Christie’s Secret Notebooks’, written by John Curran is one of the oldest books on my shelves that I have never read. I got it for my birthday (don’t even ask which year..) from my mother (also a huge Christie fan), and I was so excited to get it! You must be wondering why I haven’t touched it then. The reason is simple: from the minute I saw this book, I wanted do read it right. It analyzes Christie’s writing in several chapters, each discussing a different aspect of her novels, her methods, and each states at the beginning, under the title, which books are getting elaborated in it. Agatha Christie wrote an incredible amount of books throughout decades, and though I’ve read most of them (or at least I’d like to think so), it’s very hard to keep track, and it’s even harder to remember every little detail about all of these novels and novellas. So, I wanted to read ‘Agatha Christie’s Secret Notebooks’ along with a read/re-read session of all the books analyzed in it. And that’s a terribly huge job. Soon after I got this book, I started my most busy years spent in education, and ever since I couldn’t really afford all that time. I know, I’ve read a lot, but I like to mix it up a little, and if I’d committed to this ‘challenge’, I could’ve only read AC books… and as much as I love her work, it would be QUITE overwhelming. But now I’m thinking about picking up this book, completing this challenge that has been hanging over my head for years. I know it’s a huge job, but it doesn’t mean I can’t do it! Who says I can’t read in smaller sections? One chapter at a time, then reading other kind of books, then coming back to it… again and again. It sounds doable. There’s The British Crime Classics Challenge I’ve been eager to participate in, but, shame on me, I haven’t read any books to complete it during this year. (Three months has already passed… time goes WAY too fast…) This is the double opportunity for me: read a book from my Untouched Bookshelf Challenge pile, and also read a lot of classic crimes. Two in one! Now, I know that all the AC books are way too much to read in one year, so I stick with the original number for the BCCCh (at least 14). That’s gonna be enough for now. But I’m willing to bring this ‘challenge’ with me to the next year… and the next… whenever I can finish it. There are also many novellas discussed that are parts of collections like ‘Poirot’s Early Cases’, ‘While the Light Lasts and Other Stories’, ‘The Adventure of the Christmas Pudding’, ‘The Listerdale Mystery’ and ‘Miss Marple’s Final Cases’. Most of these books are going to be re-read for me, but I was around the age of 13-15 when I first read them – which was at least ten years ago – and I can’t wait to jump into this world again and rediscover these books! So, this is my plan! It’s probably ambicious, but I’ve wanted to do this for so long! I’m gonna do it. Have you read any of these books? Are you a fan of classic crimes or do you prefer modern ones? Next Post This Week’s New Book Releases And Reviews 2019/14. Death on the nile is my fav book ever by AC! I have started reading from the beginning and I am loving it! I do love Poirot! Good luck with your challenge! 🤣🤣 I love your style! Do it !! More of a modern crime girl myself but I’m quite happy to read a classic one every now and then! Best of luck with the challenge!! I like both. Depends on my mood which one I prefer 🙂 it’s been a while since I read several classic crimes and not just a rare occasional one, that’s why I wanted to do this challenge 🙂 Thank you!